News for nurses from winter 2013: Two thumbs up for two nurse movies, and more! For years whenever she traveled, Melodie Chenevert, a former pediatric psychiatric nurse, would comb flea markets and antique stores looking for any kind of objets d’art and memorabilia associated with the profession. She collected portraits and posters, magazine covers dating back to the Civil War era, sheet music and recordings, dolls, figurines and old uniforms. She even has a copy of Virginia Woolf’s illustrated children’s story Nurse Lugton’s Curtain. 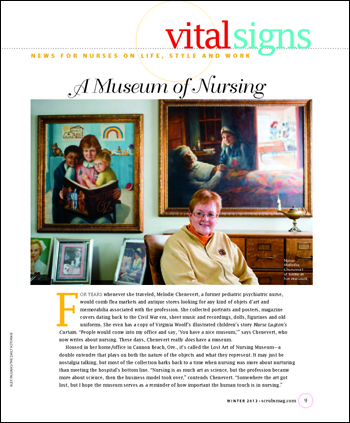 “People would come into my office and say, ‘You have a nice museum,’” says Chenevert, who now writes about nursing. These days, Chenevert really does have a museum. Going to work each day would be tough if you didn’t have a sense of humor. Just how witty can you be? Last year, Medical Solutions, a travel nursing company, provided a platform for nurses who wanted to find out by sponsoring the Nurses Week Humerus T-Shirt Design Contest (using a pun only a nurse could love). The yearly contest, which will begin again in April (each year has a different theme), has spawned a dresser drawer full of witty tees. Go to fibers.com/contests to learn how to enter the 2013 contest, and to purchase these and more of our favorite fun T-shirts for nurses, go to scrubsmag.com/magazine. If you’re tired of seeing nurses depicted in an unrealistic manner on screen, you’ll be excited about The Shift, now making the rounds at film festivals. The movie—12 hours in the life of a jaded nurse and the novice he’s supervising—was produced, written by and stars Leonel Oliva, RN, who works in the ER at a large Los Angeles hospital. The Miami-raised, Cuban-American Oliva even snagged Danny Glover, who costars as a charge nurse. Scrubs: You work three 12-hour night shifts a week. How did you have the energy to also write, produce and act in The Shift? Oliva: My dad was a truck driver before he became a nurse. He was raising us, going to school, still driving trucks. He told me that if there’s something that you need in life, you do whatever it takes to get it done. Scrubs: The Shift chronicles what happens when a young patient makes nurses question their beliefs about treating patients. What inspired you? Oliva: Most films and TV shows focus on nurses’ and doctors’ relationships, not the work. I wanted to focus on how we deal with patients who are dying and how they deal with the nurses who are caring for them. I’m sure I’m not the only nurse who’s ever been asked by a patient to let them die. And I’m definitely not the only nurse who’s been asked by a patient to not let them die. Scrubs: Most people don’t really know what nurses experience, do they? Oliva: The nurse who’s taking care of you when you strained your back may have come into your room with a straight face like nothing happened in the next room where somebody’s dad just died. How do we get through a shift dealing with these things? It’s a different world. I wanted to share that. Scrubs: You’re now, as they say in showbiz, a triple threat. Have you “gone Hollywood”? Oliva: I may leave nursing at the bedside, but I’ll still be nursing…differently. Movies heal. If you can go to a movie and experience something that you’ve been feeling but can’t get it out, it’s cathartic. So I’ll still be caring for people, just in a different way. “Nurses are involved in everybody’s lives in some way, yet few people can accurately describe what a nurse does,” says Kathy Douglas, RN, chief nursing officer for API Healthcare. Douglas, who is also a filmmaker, decided to do something to clear up the confusion, and the result—a touching and important documentary called Nurses: If Florence Could See Us Now—gives nurses the tribute they deserve. Douglas and her crew traveled the country in order to show the breadth and depth of the profession, and included interviews with everyone from bedside nurses to nurses who preside over universities, work on Capitol Hill, own businesses and conduct research. “I hope nurses realize the power and potential of their profession,” says Douglas. The RN/filmmaker was motivated to create the documentary by stories she heard through the DAISY Foundation, a group that honors nurses with an award for extraordinary service (several DAISY winners are featured in Nurses). The feature-length film debuted in October at the American Nurse Credentialing Center’s Magnet Conference in Los Angeles. Check it out at nursesthemovie.com.